Mr. Costner faces an unknown oppressor. We all feel oppressed from time to time, and some of us actually are. The Ten of Wands represents the frustrations and challenges that are faced by victims of oppression. 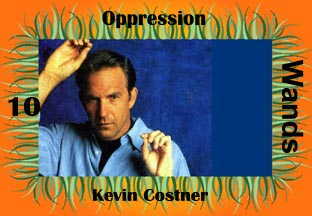 The Kevin Costner character is usually a victim of political or social oppression. Whatever side he's on is not the side that won; whatever tenets he believes are not the PC line. He fights his oppression, survives it, and finds some way to continue to live in a world dominated by his oppressors (who are by definition the bad guys).